Left: the defibrillator was damaged by vandals. Right: It has quickly been repaired by local volunteers. 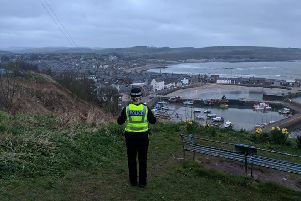 A lifesaving piece of equipment that was gifted to the people of Stonehaven has been restored after being mindlessly vandalised over the weekend. The defibrillator at the town’s Market Square was damaged on Friday night or Saturday, but thanks to fast-acting volunteers it has already been repaired and is back in operation. Stonehaven and District Community Councillor, James Stephen, commented: “The damage to the square defibrillator has been fixed with the defibrillator replaced and back in operation. “The smashed perspex was replaced and front door panel straightened (with the force of the hit to break the perspex it also twisted the door panel). The Market Square defibrillator is one of four that were given to the people of Stonehaven by Baker Hughes and John Trudgill. John’s brother Peter tragically died in hospital in 2014 after a huge wave swept him in at Stonehaven harbour. Stonehaven and District Community Council were tasked with getting all four pieces of equipment placed within the town for public use of necessary. The three other defibrillators are at Stonehaven Harbour, Stonehaven Bowling Club and inside the Co-op on David Street.